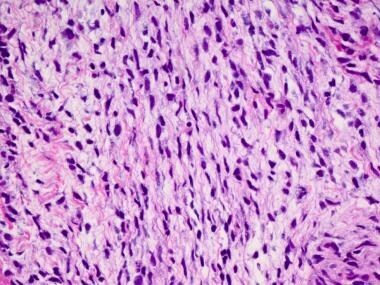 Different patterns of malignant change occur in pleomorphic adenoma, of which true malignant mixed tumor (carcinosarcoma) is one form. The other 2 forms are carcinoma ex pleomorphic adenoma and metastasizing benign pleomorphic adenoma. By definition, carcinosarcoma is a biphasic malignant tumor with a carcinomatous component and a sarcomatous component. Most of these tumors arise in the background of pleomorphic adenoma; however, some arise de novo . No clear etiology is known. However, accumulation of genetic mutations could be a factor. A history of exposure to irradiation of pleomorphic adenoma has been reported. [11, 17] The reported interval between the irradiation and the onset of carcinosarcoma varies from 1 to 36 years. Two schools of thought exist as to the origin of carcinosarcomas. The convergence hypothesis maintains that multiclonal stem cells of the epithelial and mesenchymal components play a causative role. The divergence hypothesis postulates a monoclonal origin from a single totipotent stem cell with divergent differentiation. [18, 19] The latter hypothesis is more favored. The tumor presents as a mass that may be rapidly enlarging. In some cases, the mass is painful; the pain may be localized, referred, or both. If the parotid gland is involved, signs of facial nerve weakness/paralysis are commonly encountered. True malignant mixed tumors are poorly circumscribed, with infiltrative borders. They are gray, and focal areas of hemorrhage and necrosis may be present. Some tumors are well circumscribed. Most reported tumors range from 2-13 cm in greatest dimension. A carcinosarcoma neoplasm is a biphasic tumor in which the carcinomatous component is usually a poorly differentiated adenocarcinoma, an undifferentiated carcinoma, or a squamous cell. It may also include adenoid cystic carcinoma, epithelial myoepithelial carcinoma, and salivary duct carcinoma. The sarcomatous component is usually a chondrosarcoma. Other reported sarcomatous elements include spindle cell sarcoma not otherwise specified (NOS), fibrosarcoma, osteosarcoma, leiomyosarcoma, liposarcoma, follicular dendritic cell sarcoma, undifferentiated sarcoma, myxoid sarcomas, and rhabdomyosarcoma, [26, 16] among others. The relative proportion of the 2 components is variable, and either component may dominate the histologic picture. In the images below, the sarcomatous (spindle cell sarcoma) component of the tumor is dominant, with the smaller portion being poorly differentiated adenocarcinoma. 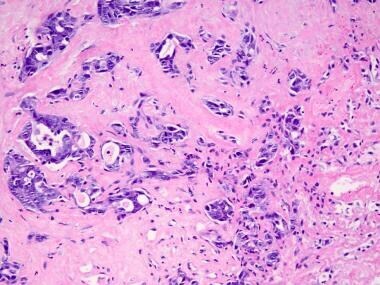 The carcinomatous component of a carcinosarcoma of the parotid gland. In this case, the tumor is a poorly differentiated adenocarcinoma. The sarcomatous component of a carcinosarcoma of the parotid gland. In this case, the tumor is a spindle cell sarcoma not otherwise specified (NOS). Metastases to other sites or lymph nodes may show the carcinomatous or the sarcomatous components alone, or the components may be mixed. The immunohistochemical panel varies, depending on the observed biphasic components of the tumor. Generally speaking, however, the carcinomatous component is usually positive for cytokeratin and epithelial membrane antigen (EMA). However, it should be noted that in very poorly differentiated tumors, the carcinomatous component may show only focal or weak positive staining for cytokeratins or EMA, a feature that is sometimes encountered in very poorly differentiated cancers of the head and neck. In such cases, electron microscopy may be helpful. The sarcomatous component is vimentin positive. Tumor spread may occur by direct extension, hematogenous, lymphatic, or perineural invasion. Carcinosarcoma is an aggressive, high-grade tumor. Recurrence, distant metastasis (54%), and angiolymphatic invasion are frequently encountered. The lungs are the most common site of metastasis. Metastasis may also occur to the liver, bones, and brain. Involvement of cervical lymph nodes with metastasis is uncommon. In a review by Gnepp,  58% of patients died as a result of the tumor. A review of 19 cases of de novo carcinosarcomas by Staffeieri et al  found that 31.6% of patients died of the disease. The median period of survival after diagnosis was 10 months; in 63% of cases, there was no evidence of recurrence after a median period of 22.4 months. Because of the rarity of the tumor, whether arising de novo or in a pleomorphic adenoma, consensus on therapeutic approaches has been lacking. A combination of surgery followed by radiotherapy seems to be statistically superior to resection alone. [16, 29] The role of chemotherapy remains unclear. How is true malignant mixed tumor (carcinosarcoma) defined? What is the prevalence of true malignant mixed tumor (carcinosarcoma)? What causes true malignant mixed tumor (carcinosarcoma)? Where is true malignant mixed tumor (carcinosarcoma) located? What are the signs and symptoms of true malignant mixed tumor (carcinosarcoma)? Which gross findings are characteristic of true malignant mixed tumor (carcinosarcoma)? Which histologic findings are characteristic of true malignant mixed tumor (carcinosarcoma)? Which immunohistochemical findings are characteristic of true malignant mixed tumor (carcinosarcoma)? Which cytogenetic findings are characteristic of true malignant mixed tumor (carcinosarcoma)? How are true malignant mixed tumors (carcinosarcomas) staged? What is the prognosis of true malignant mixed tumor (carcinosarcoma)? Kirklin JW, McDonald JR, Harrington SW, New GB. Parotid tumors; histopathology, clinical behavior, and end results. Surg Gynecol Obstet. 1951 Jun. 92(6):721-33. [Medline]. King OH Jr. Carcinosarcoma of accessory salivary gland. First report of a case. Oral Surg Oral Med Oral Pathol. 1967 May. 23(5):651-9. [Medline]. Gnepp DR. Malignant mixed tumors of the salivary glands: a review. Pathol Annu. 1993. 28 Pt 1:279-328. [Medline]. Stephen J, Batsakis JG, Luna MA, von der Heyden U, Byers RM. True malignant mixed tumors (carcinosarcoma) of salivary glands. Oral Surg Oral Med Oral Pathol. 1986 Jun. 61(6):597-602. [Medline]. Alvarez-Cañas C, Rodilla IG. True malignant mixed tumor (carcinosarcoma) of the parotid gland. Report of a case with immunohistochemical study. Oral Surg Oral Med Oral Pathol Oral Radiol Endod. 1996 Apr. 81(4):454-8. [Medline]. Carson HJ, Tojo DP, Chow JM, Hammadeh R, Raslan WF. Carcinosarcoma of salivary glands with unusual stromal components. Report of two cases and review of the literature. Oral Surg Oral Med Oral Pathol Oral Radiol Endod. 1995 Jun. 79(6):738-46. [Medline]. Gandour-Edwards RF, Donald PJ, Vogt PJ, Munn R, Min KW. Carcinosarcoma (malignant mixed tumor) of the parotid: report of a case with a pure rhabdomyosarcoma component. Head Neck. 1994 Jul-Aug. 16(4):379-82. [Medline]. Granger JK, Houn HY. Malignant mixed tumor (carcinosarcoma) of parotid gland diagnosed by fine-needle aspiration biopsy. Diagn Cytopathol. 1991. 7(4):427-32. [Medline]. Hellquist H, Michaels L. Malignant mixed tumour. A salivary gland tumour showing both carcinomatous and sarcomatous features. Virchows Arch A Pathol Anat Histopathol. 1986. 409(1):93-103. [Medline]. López JI, Ballestin C, Garcia-Prats MD, De Agustin P. Carcinosarcoma of the parotid gland: immunohistochemical study of a case. Histopathology. 1994 Oct. 25(4):388-90. [Medline]. Spraggs PD, Rose DS, Grant HR, Gallimore AP. Post-irradiation carcinosarcoma of the parotid gland. J Laryngol Otol. 1994 May. 108(5):443-5. [Medline]. Thamilselvi R, Subramaniam PM, Shivarudrappa AS, et al. Sarcomatoid salivary duct carcinoma of minor salivary gland: a rare case. Indian J Pathol Microbiol. 2010 Oct-Dec. 53(4):808-10. [Medline]. Latkovich P, Johnson RL. Carcinosarcoma of the parotid gland: report of a case with cytohistologic and immunohistochemical findings. Arch Pathol Lab Med. 1998 Aug. 122(8):743-6. [Medline]. Bleiweiss IJ, Huvos AG, Lara J, Strong EW. Carcinosarcoma of the submandibular salivary gland. Immunohistochemical findings. Cancer. 1992 Apr 15. 69(8):2031-5. [Medline]. Grenko RT, Tytor M, Boeryd B. Giant-cell tumour of the salivary gland with associated carcinosarcoma. Histopathology. 1993 Dec. 23(6):594-5. [Medline]. Staffieri C, Marioni G, Ferraro SM, Marino F, Staffieri A. Carcinosarcoma de novo of the parotid gland. Oral Surg Oral Med Oral Pathol Oral Radiol Endod. 2007 Aug. 104(2):e35-40. [Medline]. Thompson L, Chang B, Barsky SH. Monoclonal origins of malignant mixed tumors (carcinosarcomas). Evidence for a divergent histogenesis. Am J Surg Pathol. 1996 Mar. 20(3):277-85. [Medline]. Vékony H, Leemans CR, Ylstra B, Meijer GA, van der Waal I, Bloemena E. Salivary gland carcinosarcoma: oligonucleotide array CGH reveals similar genomic profiles in epithelial and mesenchymal components. Oral Oncol. 2009 Mar. 45(3):259-65. [Medline]. Götte K, Riedel F, Coy JF, Spahn V, Hörmann K. Salivary gland carcinosarcoma: immunohistochemical, molecular genetic and electron microscopic findings. Oral Oncol. 2000 Jul. 36(4):360-4. [Medline]. Bhalla RK, Jones TM, Taylor W, Roland NJ. Carcinosarcoma (malignant mixed tumor) of the submandibular gland: A case report and review of the literature. J Oral Maxillofac Surg. 2002 Sep. 60(9):1067-9. [Medline]. Sharma A, Deshmukh S, Shaikh A, Dabholkar J. Pleomorphic adenoma of the minor salivary gland of the cheek. Singapore Med J. 2013 Sep. 54(9):e183-4. [Medline]. Bovino BF, Sohn A, Winston D. Pleomorphic adenoma of the palate in a child. N Y State Dent J. 2013 Jun-Jul. 79(4):44-7. [Medline]. Kato H, Kanematsu M, Mizuta K, Aoki M. Imaging findings of parapharyngeal space pleomorphic adenoma in comparison with parotid gland pleomorphic adenoma. Jpn J Radiol. 2013 Aug 30. [Medline]. Mitate E, Kawano S, Kiyoshima T, Kawazu T, Chikui T, Goto Y, et al. Carcinoma ex pleomorphic adenoma of the upper lip: a case of an unusual malignant component of squamous cell carcinoma. World J Surg Oncol. 2013 Sep 17. 11(1):234. [Medline]. Kwon MY, Gu M. True malignant mixed tumor (carcinosarcoma) of parotid gland with unusual mesenchymal component: a case report and review of the literature. Arch Pathol Lab Med. 2001 Jun. 125(6):812-5. [Medline]. Qureshi A, Barakzai A, Sahar NU, Gulzar R, Ahmad Z, Hassan SH. Spectrum of malignancy in mixed tumors of salivary gland: a morphological and immunohistochemical review of 23 cases. Indian J Pathol Microbiol. 2009 Apr-Jun. 52(2):150-4. [Medline]. American Joint Committee on Cancer. Major salivary glands. Greene FL, Page DL, Fleming ID, Fritz AG, Balch CM, Haller DG, et al, eds. AJCC Cancer Staging Manual. 6th ed. New York: Springer-Verlag; 2002. 69-75. Alterio D, Jereczek-Fossa BA, Griseri M, et al. Three-dimensional conformal postoperative radiotherapy in patients with parotid tumors: 10 years' experience at the European Institute of Oncology. Tumori. 2011 May-Jun. 97(3):328-34. [Medline]. Patel TD, Vázquez A, Plitt MA, Baredes S, Eloy JA. A case-control analysis of survival outcomes in sinonasal carcinosarcoma. Am J Otolaryngol. 2015 Mar-Apr. 36 (2):200-4. [Medline].